The Allure Of Julian Lefray is the only book by R.S. 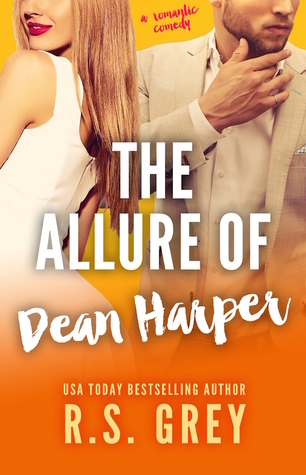 Grey that i love so much so I have a high expectation on the The Allure of Dean Harper. Unfortunately, it didnt manage to exceed my expectations. I actually enjoyed 65% of it. (lol somehow that percentage is so irrelevant) Its funny and light and SO FULL OF FOOD THAT I WAS STARVING THE WHOLE TIME I READ THIS BOOK. Damn you and your fictional food, Grey. I have some issues with Lily though. I understand that she is this one stubborn and strong girl that nothing can intimidate her. I get that demeanor, I do. But honest to God its too much. Shes too stubborn that its rude and annoying. She crossed the 'stubborn and strong hearted but insanely cool heroin' line. Shes overdone it that it doesnt look cool anymore. Whats worse is that for me, she radiates negative vibes with her. There are some scenes/parts in the book where she went overboard and outrightly rude. ITS INFURIATING OK.
Also, i'm sorry but i cant really sense the chemistry between Dean and Lily. Sometimes theyre okay but sometimes its a bit.... off? Idk. maybe its just me. There are some Dean-Lily scenes that make me want to hit her head with a brIck and knock some sense into her. Seriously, what is she playing at?